I was recently in one of the two Whole Foods in my area. 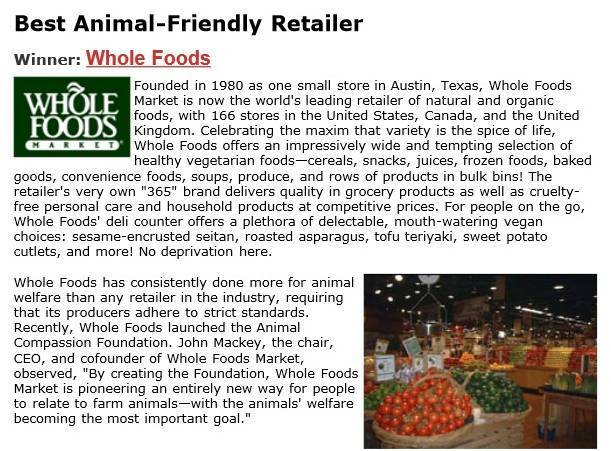 I passed by the meat counter and I saw the signs about how the animals whose corpses are sold by Whole Foods are so very well treated. I saw people buying “happy” meat. 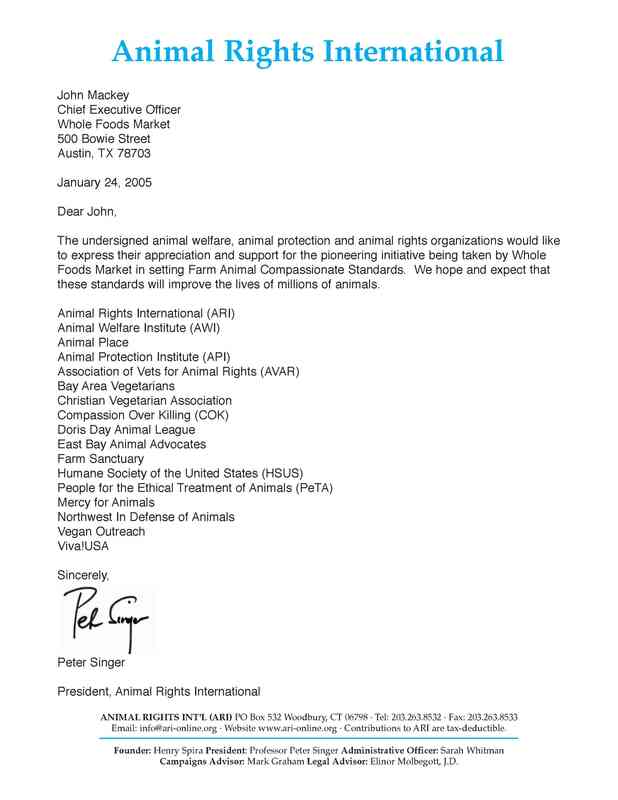 But what should she to think when Peter Singer, the “father of the animal rights movement,” and every corporate animal group–HSUS, PETA, Farm Sanctuary, Mercy for Animals, Compassion Over Killing, Vegan Outreach, etc.–expresses “appreciation and support” for the Whole Foods “happy exploitation” program? 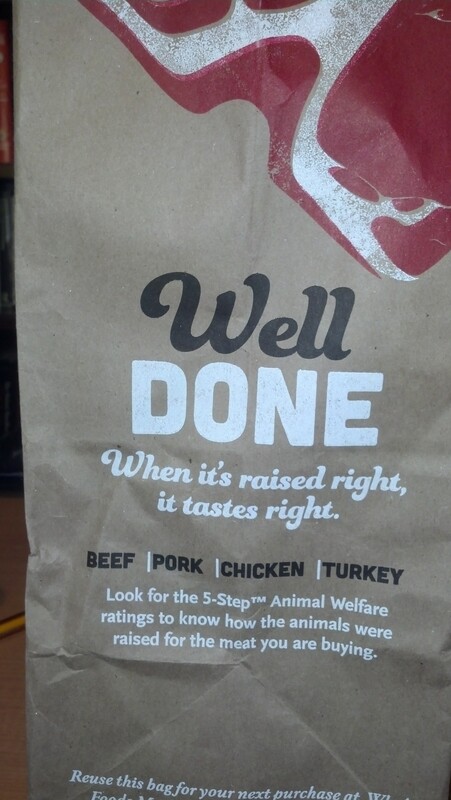 What should she think when Whole Foods receives an award from PETA? What should she think when Whole Foods CEO John Mackey shows up on the front page of “VegNews”? That woman clearly cares about animals morally and the “animal movement” has given her a way to do that that allows her to continue to consume animals and feel good about it. Our new book is now available. You can get it here. If people adopt a vegan diet for ethical reasons, everything changes. If they don’t adopt a vegan diet, they stay stuck with anti-fur protests and single-issue campaigns and nothing changes. 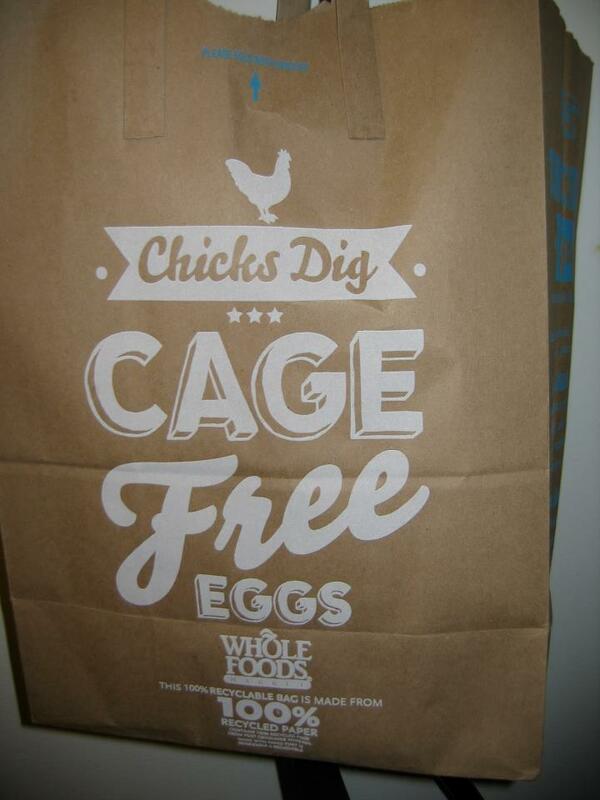 The birds do not dig being in a cage-free facility, which is like being in one large cage. They don’t dig the fact that they are bought from hatcheries that kill all the male chicks. The male chicks do not dig that much either. They don’t dig being debeaked. They don’t dig forced molting, which is still used by some egg producers (conventional and “cage-free”). They don’t dig the terrifying journey to the slaughterhouse, often transported long distances without food and water. They don’t dig being subjected to an absolutely horrendous death. They don’t dig being treated as commodities by a bunch of trendy wannabe do-gooders who are desperate to pat themselves on the back for being “compassionate” as they continue to support the torture and death of sentient nonhumans for the sole reason that they like the taste of animal products. Come to think of it, there’s not much that they dig, actually. What these poor creatures would dig is if you went vegan and stopped exploiting them. Let’s take Jensen’s test. Even if we answer that we would save the human child, what does that tell us about the morality of eating animals and animal products, or using animals in circuses, zoos, or rodeos, or wearing animals? To see this clearly, assume that there are two humans in front of the truck–an extremely old person and a baby. Even if we would save the baby, does that mean it’s morally acceptable to eat old people, or makes shoes out of them, or use them in circuses, zoos, or rodeos, use them as forced organ donors to save the young, or otherwise treat them exclusively as resources? Assume that the two humans in front of the truck are two human babies: Jensen’s child and the child of another. Jensen would clearly save his child. Does that mean that the other child has lesser moral value and may be treated exclusively as a resource? Moreover, when we are deciding what to eat tonight, we are not in any situation that is analogous to the either/or situation that Jensen posits. If, as Jensen acknowledges, we don’t need to consume animal products, then we are under no compulsion that forces us to choose. If we eat meat, dairy, or eggs when we can choose to eat vegetables, fruits, grains, beans, and nuts, then we are participating in suffering and death simply for palate pleasure. If animals matter morally at all, imposing suffering and death on them for a reason as transparently frivolous as palate pleasure cannot be justified. Jensen simply ignores the very question that we need to examine: can we justify speciesism? If you asked a white person in 1830 whom he would save from death–another white person or a black person–the answer would be crystal clear. In fact, the white person would probably not even understand the question and would think it lunacy even to ask it. So our moral intuitions are a most unreliable guide when the very problem is that our moral intuitions are affected and infected by pervasive prejudice that we cannot seem to explain or justify rationally. When I say “all sentient beings are equal,” what I mean is that, with respect to any sentient being, we are required to give a compelling moral reason to justify or excuse imposing suffering and death on that being. I maintain that my view here is not only not controversial, but that most people actually agree with it. 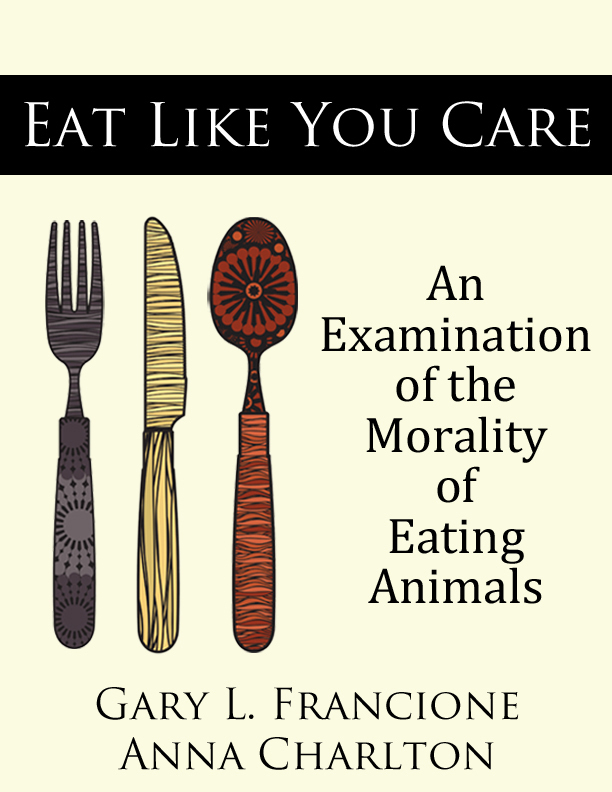 What we need to see is that pleasure, amusement, or convenience cannot suffice as “compelling moral reasons” for eating, wearing, or using animals. That necessarily leads us to rule out 99.99% of all animal use as morally unjustifiable from the outset. Robert Jensen is a generally progressive person. He really needs to rethink his views on animal ethics. I hope he will consider that if we fed all the grain we feed to livestock directly to human beings, we could go a long way toward reducing human starvation. It takes many pounds of plant protein to produce one pound of flesh; it takes many more gallons of water to produce a pound of flesh than a pound of potatoes. Frankly, if Jensen were to think that animals have no moral value whatsoever, and he accorded moral value to humans alone, he would still be committed to a vegan diet.